Somehow I had totally forgotten that Jake Gyllenhaal is playing the villain Mysterio in the next Spider-man movie until just a couple of days ago, and as if the Comic Book Movie Gods felt that tingling of my Spidey Sense (actually my Jakey Sense) some photos of Jake on the set in costume got snapped -- you can see more over here. 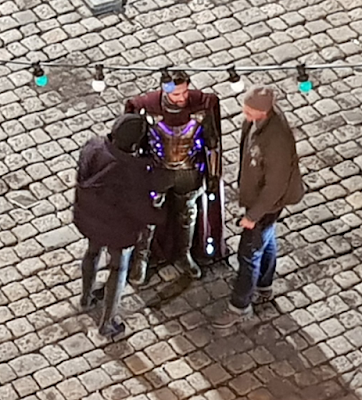 I think a couple of their pics are his stunt double but the one above is totally him, although he's been in NYC so much over the past couple of weeks with The Sisters Brothers and Wildlife coming out I don't know when he found time to fly to the Czech Republic to get on a flowy Thor cape. Jake G. in most anything will make me go see it. Yep.